2018 York Rally starts here – next meeting 9th September! The next York Rally planning meeting will be held at the Church Hall of St Chad’s on the Knavesmire, Campleshon Road, York YO23 1EY on the 9th September 2017 at 10AM. All are welcome, especially first-timers! Please just let us know if you would like a lift from the railway station. Building work means that our usual venue, kindly provided by Cycle Heaven of York, is unavailable – many thanks to them for offering it so generously for our meetings over the last few years. We hope St Chad’s will be equally convenient. We’ll be looking back at 2017 and starting to plan for 2018. Provisional dates are the 23rd and 24th June 2018 but we’re still awaiting final confirmation of the Knavesmire availability (horse racing gets first priority). Hope to see many there! Show programme off to print! 2017 programme is off to print: packed with info on the upcoming Rally! 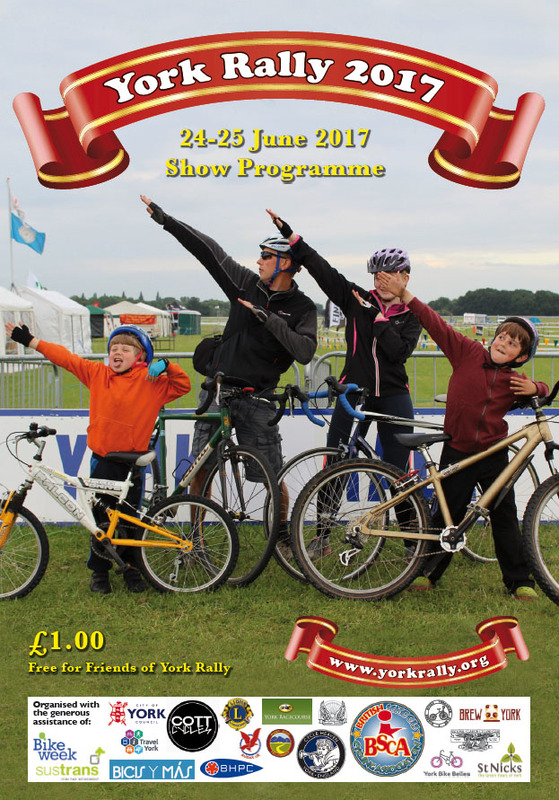 2017 York Rally: coming up fast! Campsite – advance bookings close Friday 16th! There’s just a week left to get your advance campsite booking in! We have to close bookings a week or so before the event to give our campsite team a chance to lay out the site, keeping groups together and juggling various other constraints. Campers with advance bookings can fast-track through campsite check-in (just go to the ‘pre booked’ desk) too. So book your space now. Rides list filling up – including the Audax. We still have a few rides to confirm but the rides list is filling out well. Note in particular that the traditional 100k Audax ride into the Howardian Hills is definitely happening this year – it was missed off the Audax UK website and calendar due to an oversight, but you can still enter direct with us and ride it under Audax UK rules. See the rides page for all the details of this and many other rides. York Rally Sportive – thanks to all! Many thanks to all who entered and helped with the fundraising Sportive which we ran in May. It was perfect riding weather into the North York Moors and we had some lovely feedback from riders. Special thanks to organiser Pete Dunn for taking on this demanding task, and to the all-volunteer team who made it happen! There are masses of pictures online here. Talks – inc. Chris Juden and the Cycling Bishop! 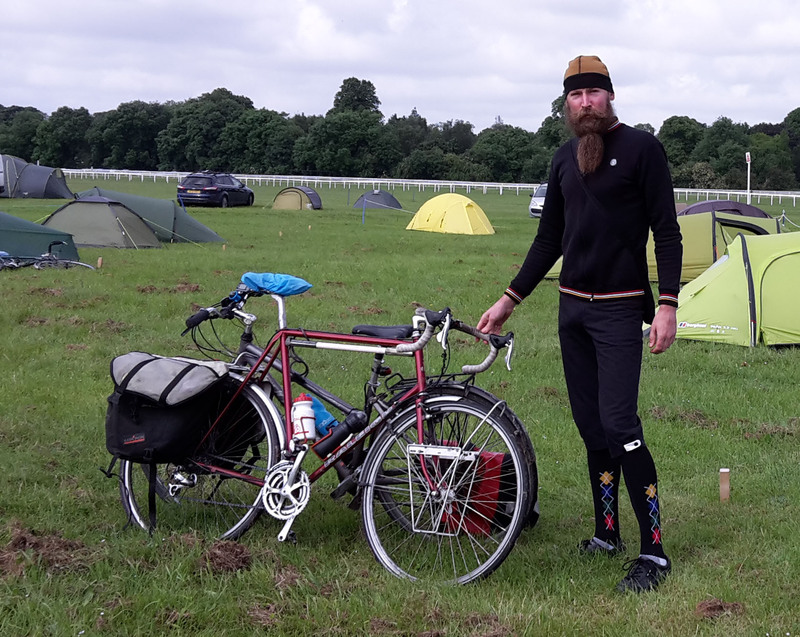 We’re still finalising the talks schedule – any proposals are very welcome – but we’re delighted that among this year’s speakers will be well known cycling technical (and much else) expert Chris Juden, whose talk “Choose your discipline” will be at 5PM on Saturday. 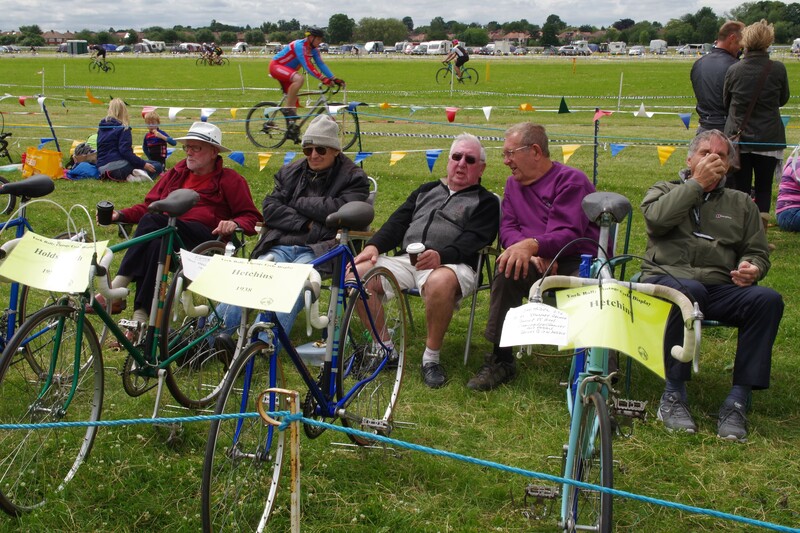 Another highlight will be Bishop John, the Cycling Bishop of Selby, whose talk will be on Saturday at 2PM. Watch the talks page on the website for a full list shortly! We’ve arranged an varied line-up of catering for this year – and it’s from several reliable providers. The fantastic grill wagon that came across from the car boot sale last year after we were let down by other caterers will be back. There will also be vegan food provided by local York bike shop/cafe Bicis-y-mas, a specialist beef burger caterer, possibly also a ‘hog roast’ type outfit, and 2 coffee vans plus a coffee tricycle! And two ice cream vans, because it’s sure to be sunny… and the relaxed bar area will be supplied with local real ale from craft brewery Brew York. 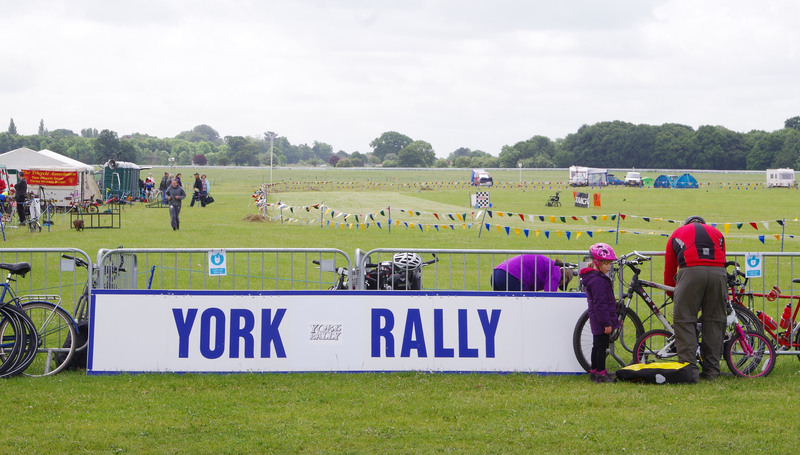 A reminder that we have a provisional date for the 2018 York Rally already! Keep the 23rd-24th June clear in your calendar. This has been cleared with City of York Council (who handle the venue hire) but is still subject to final confirmation until the 2018 horse-racing calendar is firmed up. Our final meeting before the 2017 Rally will be this Saturday – 10th June – and in a change of venue (due to local road closures for another event) we will meet at the St Chad’s Church Hall on Campleshon Road at 10AM, before walking over to the Knavesmire for a site visit. As ever, all are welcome – especially newcomers! 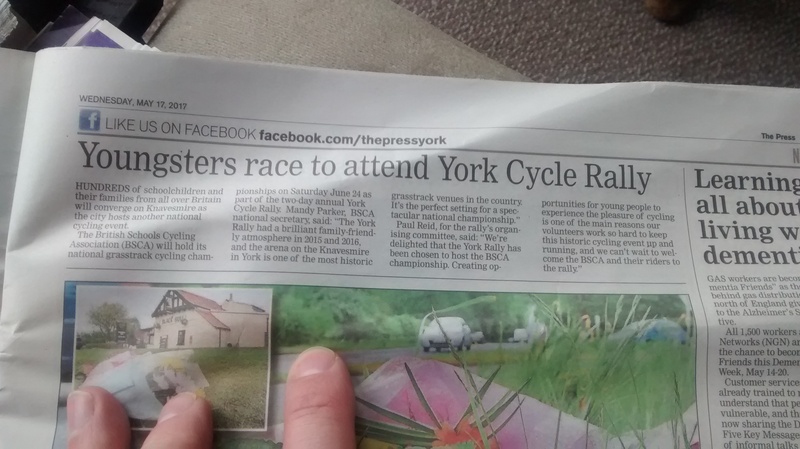 Many thanks again for your interest in the York Rally. We hope we’ll see you there again in 2017! With apologies for a rather large gap since the last update, it’s time for another York Rally update. We’ve made good progress in the last few months, have attracted a major national event to the Rally, and are looking forward to the summer already! 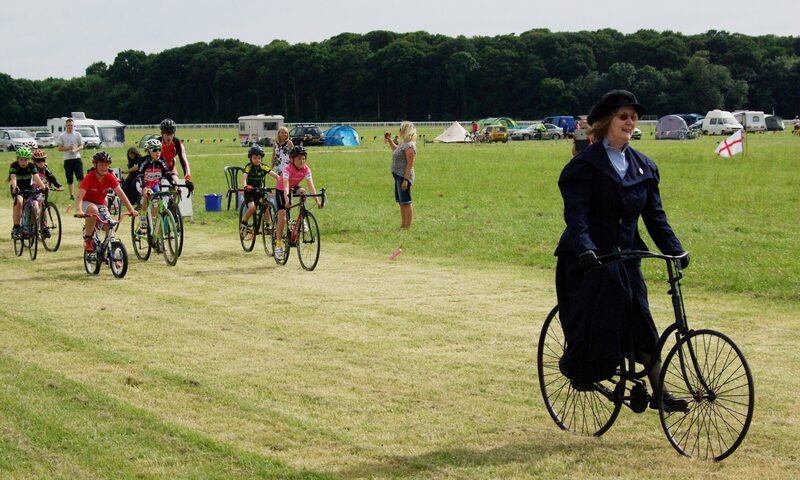 Campsite – earlybird deadline imminent! If you book into the campsite early it helps us enormously with the planning and financing of the Rally, and to recognise that, we reduce the prices for “earlybirds”. But earlybird discounts for the next Rally (24-25th June) close on the 1st April. So book your space now and you’ll get the reduced prices – and fast-tracked entry on the day. Rally to host BSCA National Championships! We’re delighted that the Rally has been chosen to host the British Schools Cycling Association (BSCA) National and Yorkshire Grasstrack Championships. This will take place in the arena on the Saturday of the Rally, and we’re also very happy that the Yorkshire Cyclo-Cross Association will be back on the Sunday. Between these two events we should have a fantastic weekend of spectacle and participation: grass roots cycling at its best. Bookings are filling up (via British Cycling online – or by post if you prefer) for our next fundraising Sportive! There’s a choice of 100km or 140km rides, taking you into the beautiful North York Moors via some demanding ascents. Even if you’re not on for riding, volunteers to help run the event are still needed. If you could help marshall, staff a feeding station or take on various tasks at ride HQ, please contact organiser Pete Dunn on 07740 171 252. 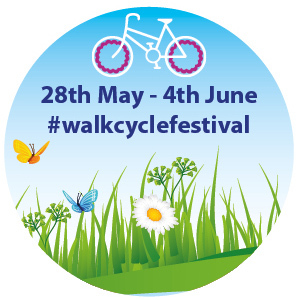 The York Rally is delighted to be taking part in the “Our Beautiful City – #walkcyclefestival” celebration starting on the 28th May – a week of walks and bike rides around York. 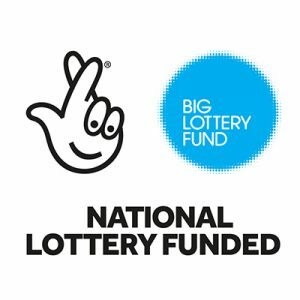 We’ll be at Rowntree Park for the opening event on Sunday the 28th May, and then we’ll be running a short bike ride to Nether Poppleton on the 29th (Bank Holiday Monday). Volunteers are always welcome to help on the stand at Rowntree Park. Or could you help lead the ride? York Bike Belles, the organisers, have a free ride leader training session on the evening of Wed, 6th May. Contact us if you’d like to take part. Our participation in this event will reap rewards in local publicity – it has already helped us get listed among York’s community cycling groups. After many months of paperwork we are finally a Community Interest Company! As I write this we’re in the process of transferring operations fully to the new structure, which both limits the personal liability of us as organisers and should make fund-raising easier. York Rally CIC will remain entirely volunteer run, and not for profit: as before, our only objective is to see the York Rally survive and prosper. We have a provisional date for the 2018 York Rally already! Keep the 23rd-24th June clear in your calendar. This has been cleared with City of York Council (who handle the venue hire) but is still subject to final confirmation until the 2018 horse-racing calendar is firmed up. We are always looking for new volunteers – both for general help on the day, and on the committee – so please do come along to a meeting if you’re interested, or to help at the Rally sign up here. Many thanks again to all who entered the 2016 Photo Competition, and apologies again for the delayed judging! We will announce the winners ASAP! Our next meeting will be at 10AM on the 13th May 2017 – please watch the website for venue details. All are welcome – especially newcomers! Next meeting – Saturday January 21st! Happy New Year to all York Rallyers! Our next York Rally committee meeting will be held on the 21st Feb 2017 at 10AM. Once again it is kindly hosted by Cycle Heaven, Hospital Fields Road, York YO10 4FS. All are welcome! Please just let us know if you would like a lift from the railway station. Photo: another fine image entered by Laura Pugh for the 2016 Photo Competition.